Two neurosurgeons of the Menninger Clinic are shown scrubbing for surgery. The Menninger Clinic is a facility for mental-health treatment, education, research, and prevention. It was started in 1919 in Topeka, Kansas, by Dr. Charles F. Menninger and his two sons, Karl and William. The Menninger Clinic philosophy of treatment was the bio-psycho-social approach. This philosophy of treatment integrated medical, psychodynamic, developmental, and family systems to treat the total health of patients. Neurosurgery is part of the medical approach. 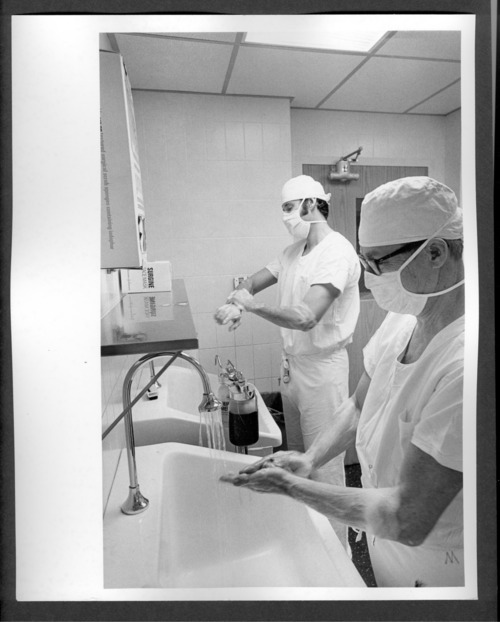 Two neurosurgeons of the Menninger Clinic are shown scrubbing for surgery. The Menninger Clinic is a facility for mental-health treatment, education, research, and prevention. It was started in 1919 in Topeka, Kansas, by Dr. Charles F. Menninger and his two sons, Karl and William. The Menninger Clinic philosophy of treatment was the bio-psycho-social approach. This philosophy of treatment integrated medical, psychodynamic, developmental, and family systems to treat the total health of patients. Neurosurgery is part of the medical approach.